Taipei, Taiwan – June 5, 2013 – Sony Corporation (“Sony”) today announced new additions to the summer 2013 VAIO line-up with the introduction of VAIO® Duo 13 and VAIO®Pro 13/11. Designed to enhance individuals’ lifestyles, the new slider hybrid PC, VAIO® Duo 13, and mobile VAIO® Pro 13/11 complete the summer 2013 VAIO line-up with the existing family-friendly VAIO® Tap 20 and entertainment-centered VAIO® Fit 14/15. VAIO® Duo 13 is a slider hybrid Ultrabook™ which provides a multitude of new use solutions with its unique form factor as well as accurate & versatile pen solutions. VAIO® Duo 13’s unique Surf Slider™ design allows for a quick and seamless transition between slate and keyboard modes. Sliding the screen back while in slate mode reveals a keyboard and a touch pad and returning it to its original position will put the VAIO® Duo 13 back in slate mode, favoring touch and pen manipulation. While in slate mode, users can easily operate VAIO® Duo 13 by touch or with its digitizer stylus, whilst keyboard mode perfectly accommodates conventional PC usage such as quickly editing documents. The convenience of slate mode, combined with the efficiency of keyboard mode, creates a greatly improved PC experience. VAIO® Duo 13’s innovative standby technology offers many advantages. For example, VAIO® Duo 13’s constant connection to the internet, even while in sleep mode, gives it the ability to continue updating applications and receiving emails when it’s asleep. On top of this, VAIO® Duo 13’s ability to wake from sleep mode in less than one second eliminates the need to wait for the PC to resume. However, the most incredible part of this technology is that VAIO® Duo 13 is able to provide these benefits without compromising battery life. On the contrary, VAIO® Duo 13 has the longest*1 battery life*2 compared with any Ultrabook™. VAIO® Duo 13’s 8M built-in rear camera featuring the “Exmor RS for PC” image sensor has made it possible, for the first time, to take images of documents clear enough for the computer to recognize and tag text. By including the “Exmor RS for PC” image sensor in the VAIO® Duo 13’s 8M built-in rear camera, Sony has made it possible to tag text in photos taken of documents and blackboards. This ability, combined with the “CamScanner” application, allows the VAIO® Duo 13 to be used as if it were a scanner snapping, tagging and saving pictures of documents and whiteboards with ease. “CamScanner” also has the ability to straighten images of documents and photos taken at odd angles; allowing individuals to focus on taking photos of important material instead of lining up the perfect shot. VAIO® Duo 13’s OptiContrast™ panel allows for a more accurate and natural writing experience when using the digitizer stylus. The digitizer stylus enables users to take notes in the memo taking application, “Note Anytime for VAIO,” or easily create their own works in “Active Clip” using pictures stored on their PC. TRILUMINOS® Display for mobile allows users access to a wide palette of rich natural colors thanks to Sony’s BRAVIA expertise. This technology has made it possible to express differences in color more accurately. It can display the subtle differences of various reds, blues, and greens, as well as emerald green. For example, TRILUMINOS® Display for mobile has the ability to reproduce the variety of reds found in a rose or blues in the sky. Combine TRILUMINOS® Display for mobile with a full HD display and Sony’s super resolution technology, X-Reality™ for mobile, and users are in for a treat. X-Reality™ for mobile analyzes each image and reproduces lacking pixels to optimize quality for the sharpest videos. It analyzes elements depending on the scene and adjusts them based on pattern, outline and color composition. It strengthens subtle patterns and accurately portrays their detailed feel, as well as reinforces bold outlines. It also enhances color composition, vividly reproducing hard-to-display natural colors. These display technologies fuse with the audio enhancing ClearAudio+ mode*3 to offer an audio-visual experience that can’t be easily replicated. ClearAudio+ mode, developed with Sony’s own signal processing technologies, allows users to effortlessly enjoy audio quality that is distinctly Sony. By simply activating ClearAudio+ mode, one can enjoy Sony’s recommended sound in ultimate clarity and presence. 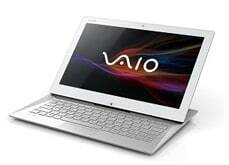 VAIO® Pro 13/11, the world’s lightest*4 *5 touch capable Ultrabook™, exhibits incredible durability and mobility. 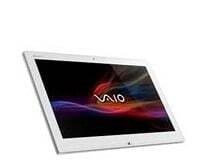 VAIO® Pro 13/11 are the lightest*4 *5 touch capable Ultrabook™ in their respective classes. By using carbon fiber throughout the case, the touch enabled VAIO® Pro 11 achieves the light weight of 0.870 kg (approx.) and the touch enabled VAIO® Pro 13 achieves a weight of only 1.060 kg (approx.). VAIO® Pro 13/11s’ uni-direction carbon fiber body and Hexa-shell design provides the additional durability required for a mobile PC. VAIO® Pro 13/11 also feature a wide key pitch and stroke to allow for an extremely natural typing experience. Additionally, VAIO® Pro 13/11 utilize a unique palm rest that gradually merges into the desk allowing for unrivaled comfort while typing. TRILUMINOS® Display for mobile allows users access to a wide palette of rich natural colors thanks to Sony’s BRAVIA expertise. Combine this with a full HD display and Sony’s super resolution technology, X-Reality™ for mobile, and users are in for a treat. X-Reality™ for mobile analyzes each image and reproduces lacking pixels to optimize quality for the sharpest videos. These technologies fuse with the audio enhancing ClearAudio+ mode to offer an audio-visual experience that can’t be easily replicated. ClearAudio+ mode was developed with Sony’s own signal processing technologies and makes it easy to enjoy Sony’s recommended sound. With One-touch*6 listening, included in all of the summer 2013 VAIO models, users can seamlessly transfer music playing on their VAIO to a wide variety of NFC (Near Field Communication) compatible*7 devices and continue enjoying the song right where they left off. VAIO® Duo 13 and VAIO® Pro 13/11 will be available worldwide, starting with select countries from the middle of June. *2 The battery life is 15 hours based on MobileMark® 2007. This is equal to 18 hours in JEITA-BAT1.0, 11 hours in JEITA-BAT1.0 (a) and 10 hours in MobileMark® 2012. The actual battery run time will vary depending on the settings and usage condition. *3 This function will be offered via an update planned for a later date. Please check your local Sony’s website for details. *4 As of June 5th, 2013, in the touch capable 13 inch Ultrabook™ class. *5 As of June 5th, 2013, in the touch capable 11 inch Ultrabook™ class.